on the bridge increased due to the accumulation of debris on the guardrail as well as the upper deck. ov er the country (NIDP , Yoon , Woo and Park [3 ]) . of the bridge upper deck is lower than the levee height. (Kim , Joo, Lee, Lee and Yoon ). than 800 - 1500 m, and th e river flows along the valleys. the shore areas are narrow, but curves are we ll developed. posed on the river bed where the piers were constructed. and the flow of the Im -Jin River. Figure 1. 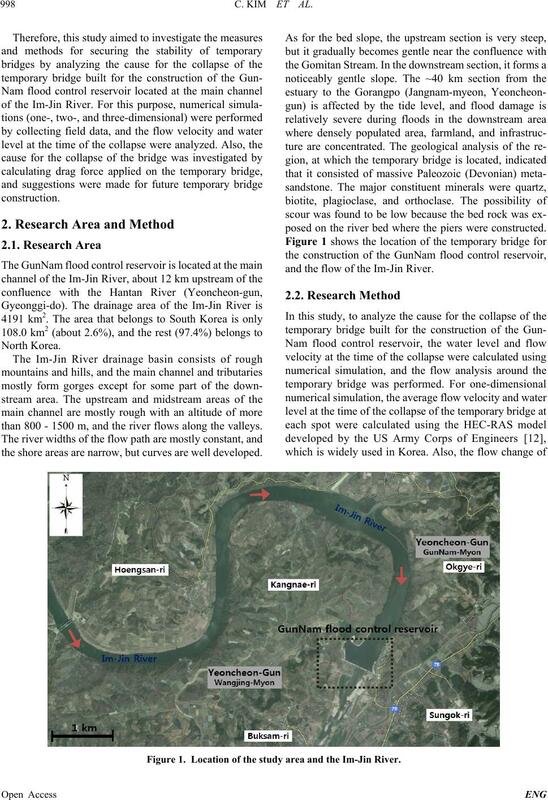 Location of the study area and the Im-Jin River. water levels of the cross section were EL. 31.06 m - EL. section were 5.10 m/s - 5.34 m/s (Table 1 and Figure 3). flood control reservoir at the study area. of the collapse of the temporary bridge. Figure 3. Water-level of the temporary bridge. entire boundary conditions, the water levels were EL. phenomena occurred at the end part of the cofferdam. simulation at the 13:10 bound ary condition. Table 2. 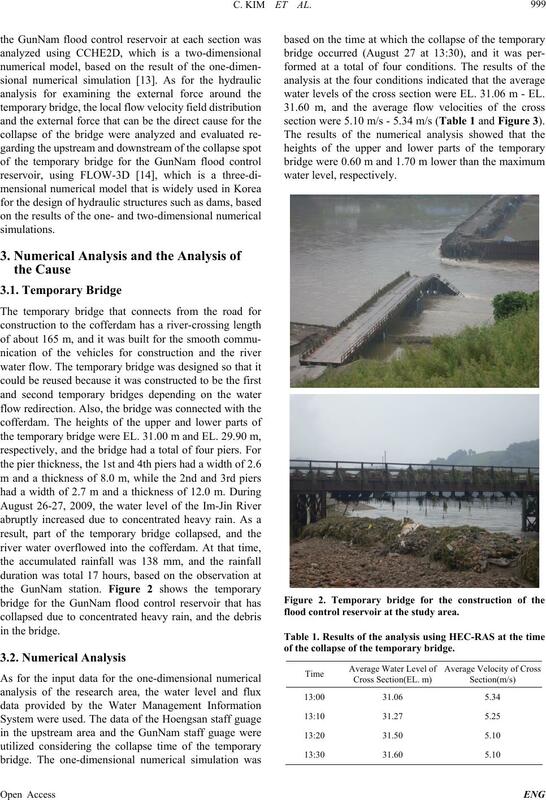 Results of the analysis using CCHE2D at the time of the collapse of the temporary bridge. (EL. m) Velocity (m/s) Water surface EL. Figure 4. 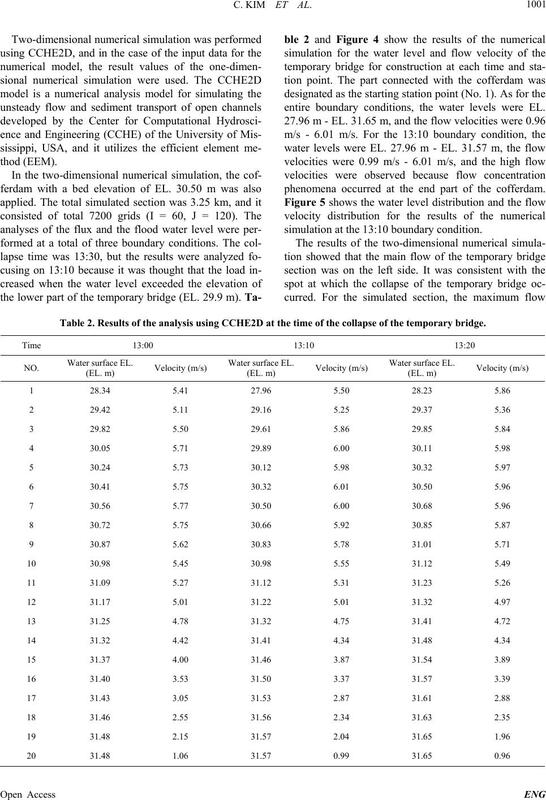 Water level and velocity around te mpor ary bridge (CCHE2D). Figure 5. 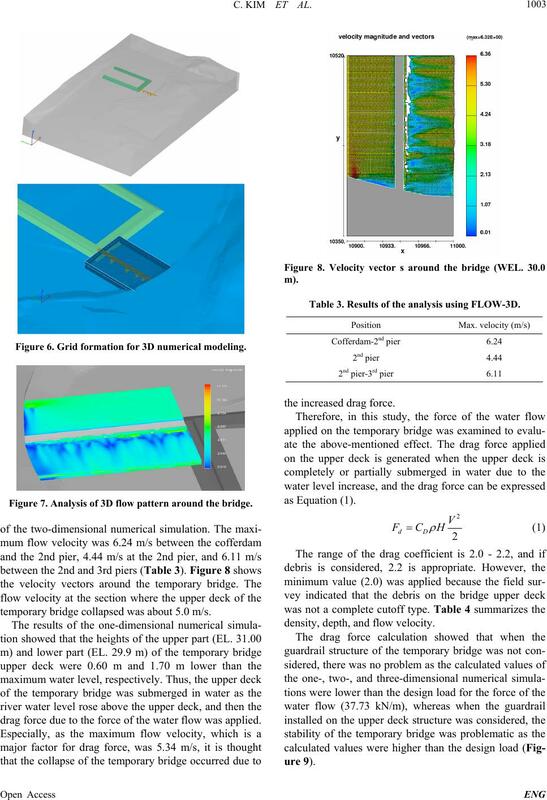 Numerical modelling results around tempor ary bridge (water EL., veloci ty). cross section caused by the cofferdam. were analyzed at each spot. Figure 6. Grid formation for 3D numerical modeling. Figure 7. 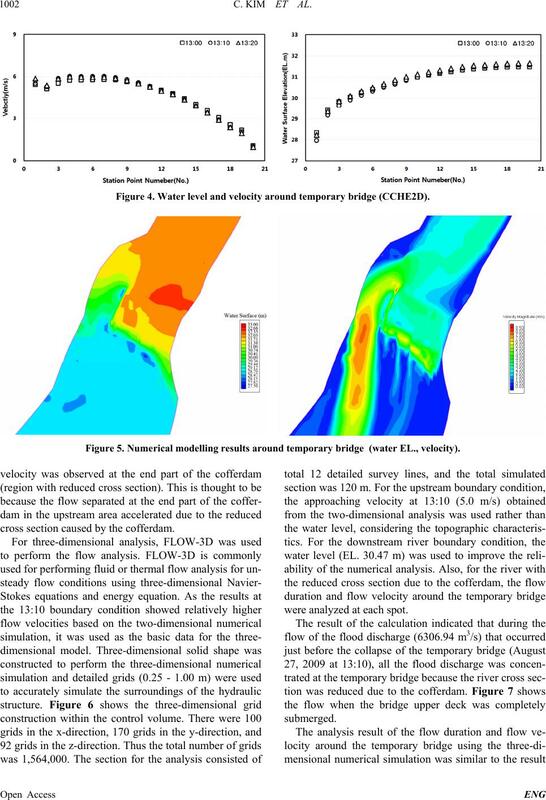 Analysis of 3D flow pattern around the br idge . temporary bridge collapsed was about 5.0 m/s. drag force due to the force of the water flow was applied. Table 3. Results of the analysis using FLOW-3D. density, depth, and flow velocity. Figure 9. 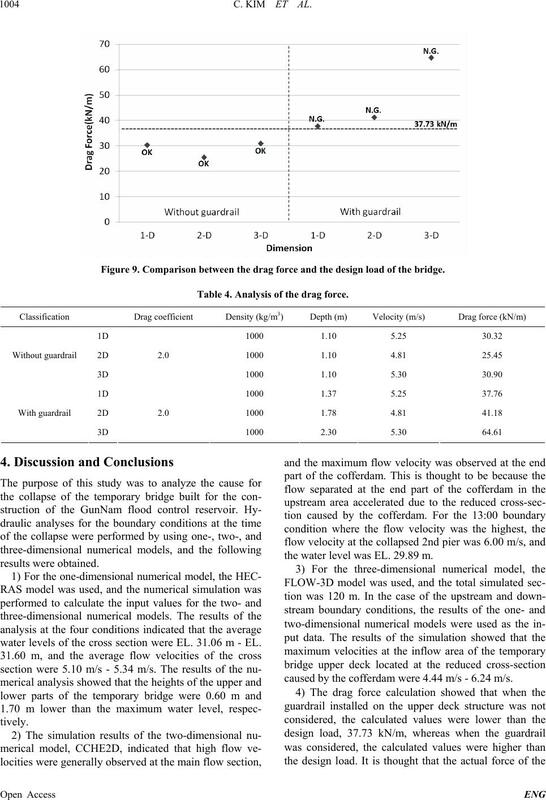 Comparison between the drag force and the design load of the bridge. Table 4. Analysis of the drag force. results were obt aine d.
the water level was EL. 29.89 m.
caused by the cofferdam were 4.44 m/s - 6.24 m/s. 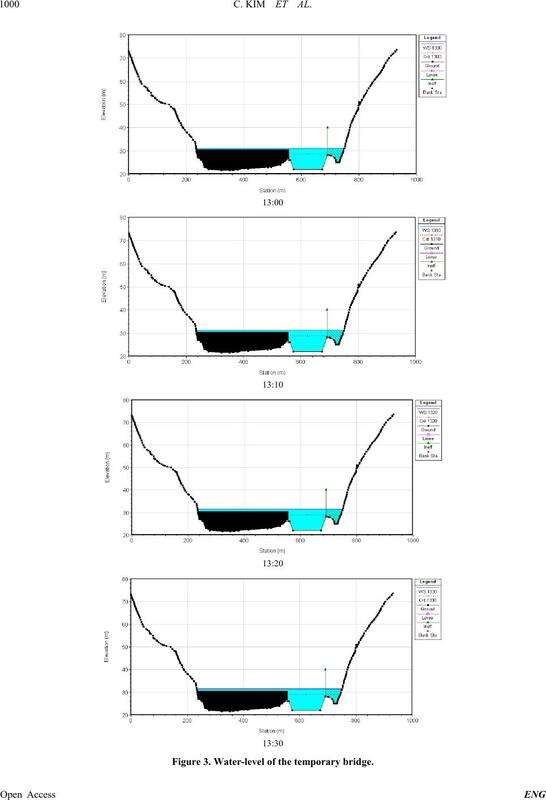 pected water level based on the design frequency. sign frequency for securing stability is a difficult task. debris is expected to be large. 2002,” NIDP-2002-01, 2002, pp. 9-30. Industrial Technology, Vol. 7, No. 1, 2002, pp. 137-141. No. 5, 2007, pp. 37-43.
of Seonam, 2008, pp. 1-13.
draulic Engineering Circular 20, 1991. Resources Association, V o l . 38, N o. 8 , 2 0 05, pp. 675-689. Disaster Prevention, 2006, pp. 5-13. 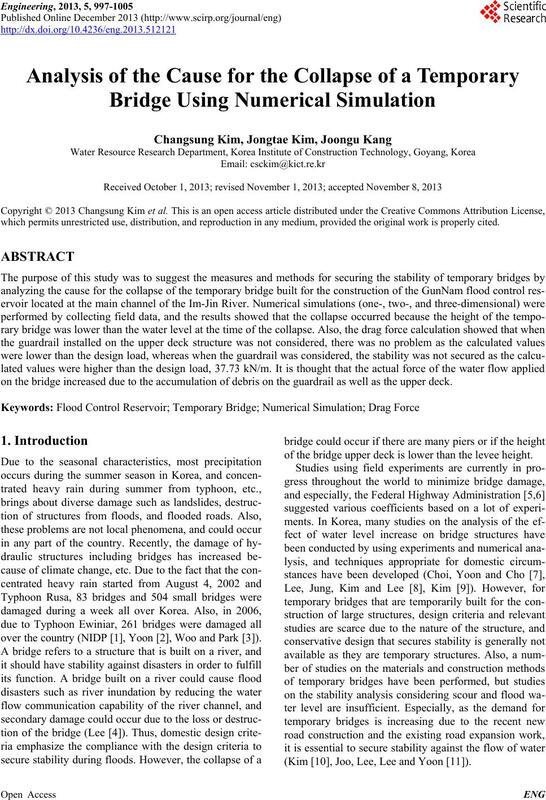 Temporary Bridge Using Continuous Cross Beam,” Ph.D.
Thesis, University of Hongik, 2012, pp. 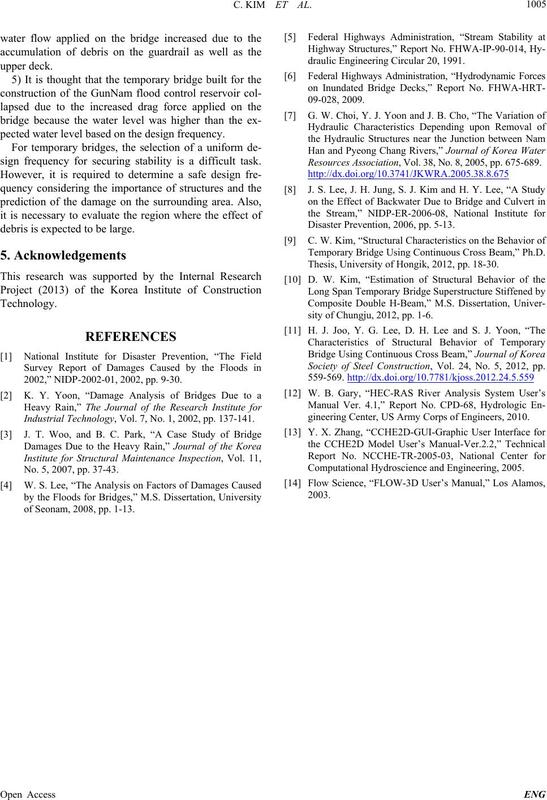 18-30.
sity of Chungju, 2012, pp. 1-6. Society of Steel Construction, Vol. 24, No. 5, 2012, pp. gineering Center, US Army Corps of Engineers, 2010. Computational Hydroscience and Engineering, 2005.